Now we take a look at the listening section test given for National Exam SMA 2011. Exercise on listening test needs three important materials. They are of course the audio to be heard, test book (soal), and transcript of the audio. If you have not had the audio MP3, you can download here. For the test book you can see here and this is the transcript of the audio you have downloaded in the link above. How to do exercises for this listening test? First, you have to listen carefully to the audio file then read the questions and choose the best answer based on the audio. If you have listened several times and you still have no idea about what you hear, refer to this script! You will see that listening test is not as complicated as it is seen. 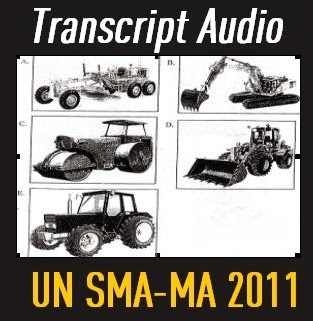 Here we go, the transcript of the audio test UN SMA 2011. In this section of the test, you will have the chance how well you understand spoken English. There are four parts to this section with special directions for each part. PART I: Questions 1 to 4. Directions: In this part of the test you will hear some dialogues and questions spoken in English. The questions and the dialogues will be spoken twice. They will not be printed in your test book, so you must listen carefully to understand what the speakers are saying. After you listen to the dialogue and the question about it, read the five possible answers, and decide which one would be the best answer to the question you have heard. Boy : Do you use internet very often? Girl : Yes, I do. I use it for communication. Boy : How do you communicate with it? Girl : I send and receive emails, and I speak with my friends using voice mail. What is the main topic of the conversation? A. How to use email. The best answer to this question is “internet usage” therefore you should choose answer (B). Woman: Holidays are coming up. What do you plan? Man: I’m going to Bali. I would go to some tourist resorts such as Tampak Siring, Bedugul, Kintamani, Kuta, and Kuta square. I would go shopping, swimming, and see beautiful scenery. I’m going to be there for a week. Narrator: What is the main topic of the conversation? Woman: Hello Jack? Where’re you now? Man: I’m still at the office. Why? Woman: I need to see you. Pease wait for me there! Narrator: Where will the woman go? Man: When will you come over dinner? Will you come tonight? Woman: Not tonight. I promise to go to the concert with my brother. Man: Well, how about Friday, then? Narrator: Why is the woman not able to go to dinner? Woman: Look at me! Does this long red dress suit on me, John? Man: I don’t think so. I think the green long dress is better than the red one. Woman: How about the short black one, then? Man: Yes, that suits you. You look gorgeous with that one. Narrator: Which dress suits the woman? Directions: In this part of the test, you will hear some incomplete dialogues spoken in English, followed by four responses, also spoken in English. The dialogues and the responses will be spoken twice. They will not be printed in your test book, so you must listen carefully to understand what the speakers are saying. You have to choose the best response to each question. Now listen to a sample question. Man : Where are we going to stay? Woman: At the Sun Hotel, near the beach. What will the woman most likely reply? B. It provides excellent service. C. There’s a hotel there. D. It’s on the beach. The best answer to the question is choice B “It provides excellent service.” Therefore you should choose answer B.
Narrator: What is the most appropriate response for the woman to give? Narrator: What is the man most likely to reply? Man: What is the matter, Dara? You look sad today? Narrator: What is the most appropriate response for the man to say next? PART III Questions: 8 to 11. Directions: In this part of the test, you will hear some dialogues or monologues spoken in English. The dialogues or monologues will be spoken twice. They will not be printed in your test book, so you must listen carefully to understand what the speakers are saying. After you listen to the dialogue or monologue, look at the five pictures provided in your test book, and decide which one would be the most suitable with the dialogue or monologue you have heard. Man: Oh, I’m so exhausted. Woman: What is the matter? Woman: Why didn’t you use a tractor? Narrator: Which picture shows the woman’s suggestion? Man: I think I’ll take a kilo of pears. Cindy, do you want any apples, mangoes, or bananas? Narrator: Which picture shows the fruit the woman’s need? Woman: Located in the Eastern side of Bali. Sanur beach is easily reachable from Denpasar as it is only a 5 to 10 minutes drive away. Sanur is beautiful place to watch the sun rise over the water and to see boats anchored at the shore. Its white sandy beach is perfect for swimming or relaxing. PART IV Question 12 to 15. Directions: In this part of the test, you will hear several monologues. Each monologue will be spoken twice. They will not be printed in your test book, so you must listen carefully to understand what the speakers are saying. After you hear the monologue and the question about it, read the five possible answers and decide which one would be the best answer to the question you have heard. Daniel Jacob Radcliffe is a British actor. He is best known for playing harry potter in the feature film series based on a popular book series. Radcliffe was born on 23 July 1989 in Queen Searle Hospital West London, England. He is the only child of Alan George Radcliffe, a literary agent and Marcia Jeanette Garcia, a casting agent who was involved in several films. What is the main topic of the monologue? What is Daniel best known for? Ladies and Gentlemen, in case of emergency, take the life jacket which is located under your seat. Put the life jacket over your head and then fasten the jacket tapes around you’re your waist. Do not inflate the jacket until you left the aircraft. The jacket will be automatically inflated by pulling a cord, but if not, you can blow into the chip to inflate it. A light is attached to the jacket for attracting attention. The life jacket should be removed only in case of emergency. The use of TV set, AM and FM radios and radio cassettes recorders, walkman, and any mobile phones are prohibited on board as they interfere the communication and navigational system. We wish you an enjoyable flight. Where is the life jacket located? What can interfere the navigational system? This is the end of the listening section. To get best score in listening test, I think, listening to similar questions more and more is the only cheap way to reach it. So never give up for exercising.